their first video clip “Follow Your Dream” . Sabbath cover)” with legendary drummer Vinny Appice (Dio, Black Sabbath and Heaven & Hell). Female singer Juliana Furlani (Brazil) and drummer Tim Zuidberg (Netherlands) joined 2 months later and brought great performance and energy to the group. In February 2012 the group recorded video clip “Believe” with 2 new members: guitarist Kevin Ellerby (USA) and flute player Uğur Kerem Cemiloğlu (Turkey). 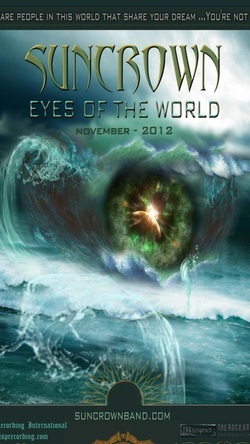 In June the group a new musicvideo -“Eyes of the World”- was made which showed the essence of the full group. themselves away to spend hours together crafting their songs, before heading out on the road, a tight knit gang ready to take on the world. However in 2013 the split between bands in this image and disparate musicians collaborating across the internet super highway comes ever closer to 50-50. Suncrown are one of the latter, although crucially, even after countless listens to their 'Follow Your Dream' debut, you'd never know that the eight musicians vital to this collection of ten soaring tracks of chest beating Power Metal with Symphonic leanings, are as far flung as Ukraine, Turkey, Brazil, the Netherlands and the USA. Often these types of projects feel disjointed and lacking in any true identity. 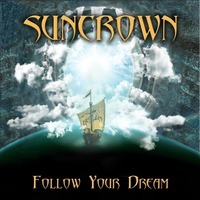 However, Suncrown class themselves as a band and that ethos shines through strongly on an album that owes much to the atmospheric layers, enigmatic vocals and stinging guitars that Kamelot or Serenity do so well. This band may not quite belong with such exalted company yet, but impressively, they really aren't that far away. The stabbingly lethal guitars from Gustavo Bonfa and Kevin Ellerby set the scene confidently, delivering a barrage of mighty riffs and smarting solos. However it is the atmospheric embellishments provided by the ever present Oleg Biblyi on keyboards that really take Suncrown and raise them to a level well above that expected from a debuting act. notifications straight to your mobile device.